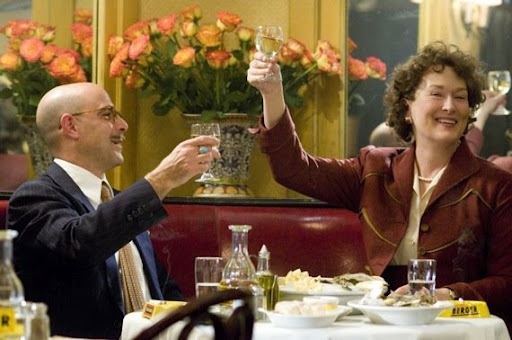 A word of warning: Do not go to see Julie & Julia on an empty stomach. By the time the movie’s over, you’ll feel downright famished. (That’s meant as a compliment, just in case it isn’t clear.) And that’s not just because there’s a lot of food in this movie, and it’s not just because the food looks really good. It’s because the movie is such a treat that you’ll just want to eat it up. 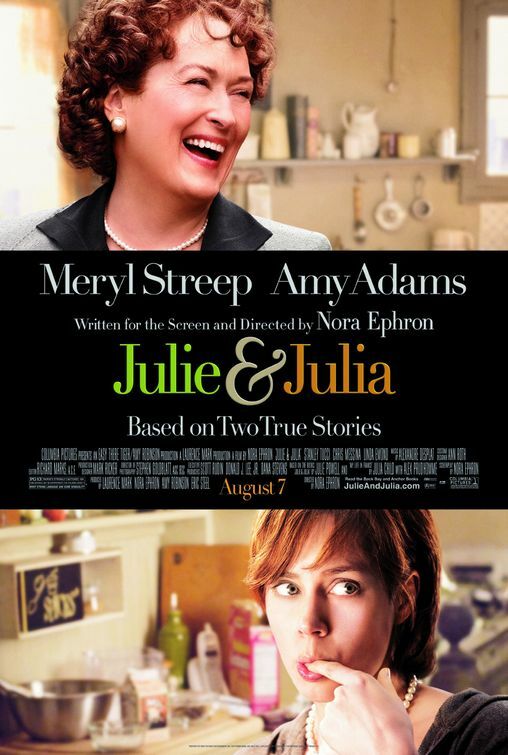 Julie & Julia is based on the book of the same name by the real-life Julie Powell (played here by Amy Adams), who decided to kick-start her life in 2002 by spending a year cooking every recipe in Julia Child’s cookbook, Mastering the Art of French Cooking, and blogging about it (before blog was a household word). The movie doesn’t just make Julia Child an inspiration, it also makes her a character, by weaving in the story of Child’s own life in Paris during the 1950s (this part is based on My Life in France, Child’s autobiography). The movie shows how these two women found more than a hobby in food, and how their passion for cooking transformed their lives. As Child, Meryl Streep is nothing short of a total pleasure to watch. She plays this woman with so much joie de vivre that it’s no wonder Child had so many fans. Nailing the chef’s sing-songy accent and walking around with a perpetual smile on her face, Streep is goofy, great fun, and just delightful. You almost wish the entire movie was about her (and it probably could have been). Thankfully, Adams and the other members of the cast (including Streep’s Devil Wears Prada co-star Stanley Tucci) are all enjoyable as well, and the jumping back and forth between the two stories is handled smoothly. If anything, the meal is a bit over-cooked; writer/director Nora Ephron could probably have trimmed about 10 minutes and it would have been fine. But like Child herself would probably say, it’s alright to make a mistake or two when the end result is so tasty. I’m giving Julie & Julia a B+ and wishing you a hearty bon appetit!